Home > News > Sudan Hosts the 4th International Scientific Conference on "The Role of the Islamic Economy in the Building the Economies of the State"
Khartoum — The Fourth International Scientific Conference, organized by the University of the Holy Quran and the Authentication of Science entitled “The Role of the Islamic Economy in the Building the Economies of the State”, started Sunday at the Friendship Hall, in the presence of a number of university vice-chancellors, economists and scientists from inside and outside the Sudan. The opening session of the conference was addressed by the Minister of Higher Education and Scientific Research, the Chairman of the Holy Quran University Council and its Rector and a representative of the participating foreign delegations. 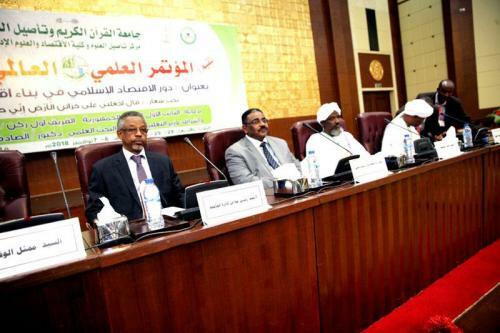 Five scientific papers was presented in the first sitting of the conference, which was chaired by Vice Chancellor of the University of Khartoum Prof. Ahmed Mohamed Sulaiman. The papers included the concept of the Islamic economy; its origin and development, the Basic Concepts of the Islamic economy, Authentication Vision for Islamic Banks and the Concepts and Values of the Islamic Economy and its Relation to Social Justice as well as the Role of Islamic Economy in Realization of Sustainable Development and Corruption Reduction, presented by a number of scientists from within and outside the Sudan. Meanwhile, the University honored a number of dignitaries including the President of the Republic, the First Vice President and the Minister of Higher Education for their role in serving the University.